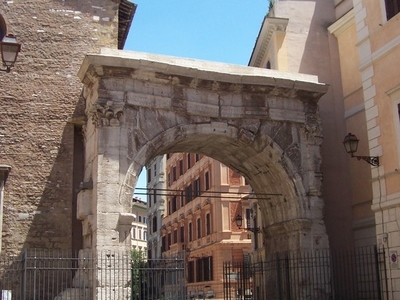 The Arch of Gallienus is a name given to the Porta Esquilina, an ancient Roman arch in the Servian Wall of Rome. It was here that the ancient Roman roads via Labicana and via Tiburtina started. The arch was rebuilt in monumental style in the Augustan period. In 262, the equestrian (Marcus) Aurelius Victor rededicated the arch to the emperor Gallienus and his wife Cornelia Salonina. It still stands in the Via di S. Vito (the ancient Clivus Suburanus - the sequel, the Via S. Madonna dei Monti, follows the course of the ancient Argiletum, the main road to the Roman Forum). Already in the Augustan period the Porta Esquilina should be included in the Esquiline Forum, that included the market called the Macellum Liviae. When these buildings were abandoned in late antiquity, the diaconia and monastery of San Vito (cited in the Einsiedeln Itinerary) took them over, cited already in the itinerary of Einsiedeln. It is this church against which the arch's remains now rest. The surviving single arch is of travertine, 8.80 metres high, 7.30 wide, and 3.50 deep. The piers that support it are 1.40 metres wide and 3.50 deep, and outside of them are two pilasters of the same depth, with Corinthian capitals. The entablature is 2 metres high with the dedicatory inscription on the architrave. Beneath the spring of the arch on each side is a simple cornice. A drawing (HJ 343) of the 15th century shows small side arches, but all traces of them have since disappeared (PAS ii.76; Sangallo, Barb. 25v.). Here's the our members favorite photos of "Monuments in Rome". Upload your photo of The Arch of Drusus!